One Stop Shopping. About us Importex. Jewelry Custom design. Jewelry remodeling. Pearls Stringing. Diamonds GIA certified. This classy one strand knotted necklace made from round white freshwater pearls. The necklace secured by strong 925 Sterling Silver filigree clasp. 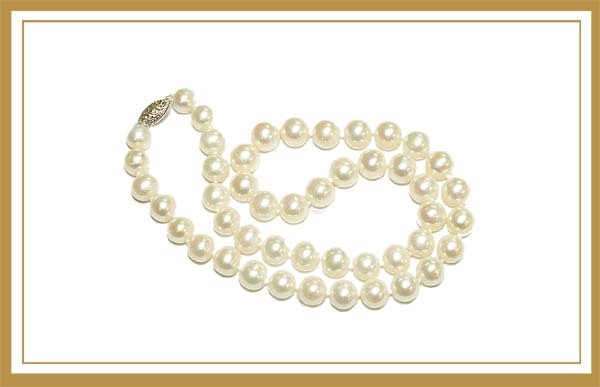 Strand is 17" long and pearls are about 7mm average. Shopping with us means you will be getting personal service, shopping directly from the wholesaler, through the medium of eBay, thereby skipping any intermediaries. Jewelry Custom design. Jewelry remodeling. Pearls Stringing. Diamonds GIA certified. Crash course in the 4c’s. Precious, Semiprecious and Synthetic Stones, Settings and Findings.